Is now the time to sell Jelavic? Nikica Jelavic arrived at Goodison in the January transfer window of 2012 and immediately made a name for himself, bagging a hatful of goals and terrorising Premier League defences. He was the darling of the Gwladys Street, with fans singing his name with luster as Everton made their way to Wembley, only to fall agonisingly short against Liverpool in the FA Cup Semi Final. However, the dream move, which appeared to suit both parties, turned sour last season. With the Croatian international struggling for goals he found himself out of the team as his confidence nose-dived. David Moyes certainly decided that the former Rangers man was no longer needed at Everton and made Victor Anichebe his first choice centre forward. 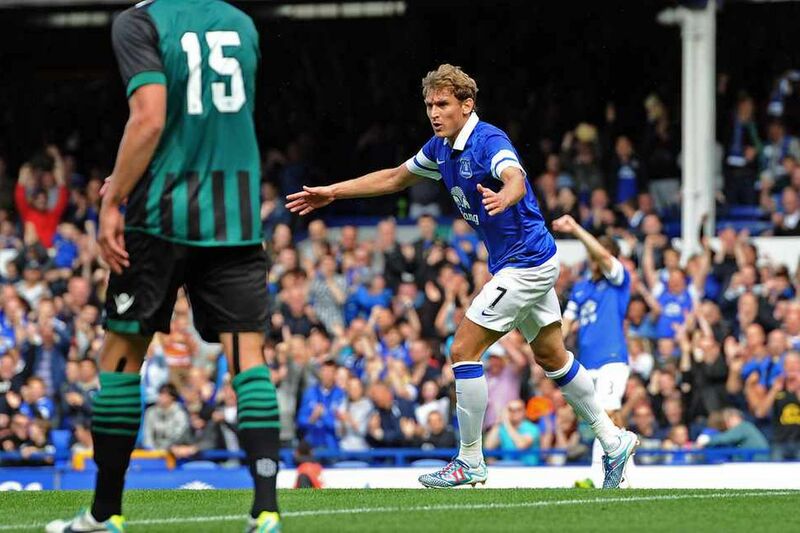 This summer, Jelavic was strongly linked to a move to German side Hamburg. The fallen giants of German football were certainly keen, with influential figures at the Bundesliga side openly speaking to the press of their interest. Everton and new manager Roberto Martinez were not keen to sell and placed a price on Jelavic’s head that put him firmly out of reach of Hamburg. General Manager Oliver Kreuzer spoke to Bild to confirm that the Blues had put Jelavic out of reach. The reaction amongst supporters to the potential sale of Everton’s number 7 was certainly not unanimous, although it is fair to say the vast majority wanted the Croatian to stay at Goodison Park. That faith appeared to be well placed, especially when Jelavic enjoyed an electric pre-season campaign, bagging goals against Blackburn, Real Madrid and Real Betis. His form was so strong, that he held off the challenge of new signing Arouna Kone to start the season as Everton’s first choice striker. However, fast forward two months and Jelavic is consigned to the bench without a single goal to his name. He now looks further away from the first team than ever before, with Romelu Lukaku seizing the opportunity to become Martinez’ preferred starter in attack. So what now for Jelavic? Has your view changed? Would you consider selling the Croatian in the January window, or will Everton need him when Lukaku returns to Chelsea in the summer? Next Post Leighton Baines, player of the month??? I think it is time to sell Jelevic and would probably raise another £5m perhaps? But we have to go all out to find something that comes close to Lukaku as come next May he will definitely be going back to Chelsea. Everton fans should not waist their time dreaming that Lukaku might sign for us after his loan because they were the same hopes that West Brom had last year. However, this year is very different as the whole world knows who Lukaku is now and if Chelsea bizarrely didn’t want him next season you can guarantee that Europe’s richest and biggest clubs will lure him away. An Everton without Jelevic, Lukaku and Anichebe is a mid table team, so it is imperative that we go out and find that £20m striker that can get us 20+ goals a season. Now is definitely not the time to sell Jelavic, given it’s October and the transfer window doesn’t reopen for nearly three months. Yeah totally agree Stewart, BUT I would give Jelavic chances to prove he’s not finished before 1st Jan, then sell him, we ought to get 6M! Would love us to get Honda, class act he is would drive the midfield forward and scores goals. If McCarthy isn’t good enough I’D SELL him too and bid for Defour at Porto, who we were interested in, couple of seasons ago! We need to think about this in the long run, Say we sell Jelavic in January, that means next summer we will only have 1 striker , arouna Kone, i dont know about the rest of you, but that worries me! hopefully we can get someone thats Lukakus standard, doubt it though! By my calculations we do actually still have £17m to spend from the last window as even though we bought McCarthy for £13m, we actually loaned Barry and Lukaku, so any money we can add to that from Jelevic and Heitinga should be more than enough to go out there and get a Soldado / Lukaku type striker. We also have Vellios, remember. I’d like to see him come on for about 15 mins at the end of a game when Lukaku is tired. If Everton can raise around 7 million from a Jelavic sale, then it’s a no brainer. Though I disagree with Stewart regarding keeping Lukaku, maybe I am kidding myself but at the end of the season he’ll only have two years left on his contract, plus after his agent said they’ll consider other options why won’t Lukaku join Everton if the cash is raised? Despite his strength and goals he has a awful lot to learn, it would best serve him coming to Everton and playing every week, rather than go to Juventus or Citeh and being a bit part player again. Sorry Captain but Lukaku is very aware just how good he is and he has said on several occasions that he wants to be the best and play with the best. I have been an Everton fan for 30 years and as much as I would love to say that we are the best, we are not and a world class player would not play out his career at a club that has a great team and ethos but no finance to back that up.